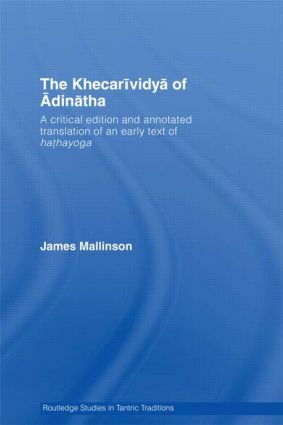 Describing one of the most important practices of hathayoga (khecarimudra), the Khecarividya of Adinatha is presented here to an English-speaking readership for the first time. The author, James Mallinson, draws on thirty Sanskrit works, as well as original fieldwork amongst yogins in India who use the practice, to demonstrate how earlier tantric yogic techniques developed and mutated into the practices of hathayoga. Accompanied by an introduction and an extensively annotated translation, the work sheds light on the development of hathayoga and its practices. 'This remarkable book is the second volume of the Routledge Studies in Trantric Traditions, edited by Gavin Flood. Beautifully produced by the author…..Due to the highly technical nature of the material, this winning combination of authorial attention to detail with a highly elevated sense of aesthetics, results in not merely a book but a work of art. James Mallinson has a BA and DPhil in Sanskrit from Oxford and an MA in South Asian ethnography from SOAS. He has spent several years living with sadhus and yogis in India and now translates Sanskrit poetry for the Clay Sanskrit Library and yoga texts for YogaVidya.com.